Two story foyer-Open floor plan -Formal DR with Decorative Panel - Crown Molding & Hardwood on 1st floor. .Granite Eat in kitchen - Breakfast area - SS Samsung range, Vented Microwave & Dishwasher. Patio door to level backyard.-Gas Fireplace in FR. 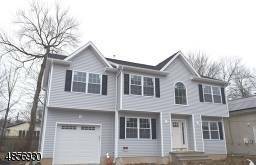 Custom Railing for stairs - Second level offers Master Suite with Vaulted ceiling with recessed lights, two Walk in closets & En suite with Shower & Soaking tub - 3 other bedrooms & Laundry Hook ups - Double Granite vanities in Upstairs bathrooms. Ceiling Fan/lights - Deck & Full basement & 1 car garage - All city Utilities , 2 Zone cooling & Gas heat & cooking. - Great location with easy access to highways& shops - East Facing brings Sun light to all rooms - Taxes will be assessed after sale - 10 Year New home warranty.